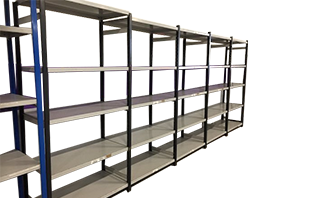 Shelving solutions allow you to organise your space in an efficient and manageable way, ensuring that you can easily store, identify and find items as and when needed. At Rackzone, we are committed to providing storage shelving solutions that suit every budget. For that reason, we stock a range of pre-owned shelving solutions which can provide you with all the advantages that quality shelving can give but at a fraction of their original price. This option is perfect for you if you are working within a constrained budget or simply want to enhance your available storage in a cost-effective way. We ensure to check the quality of all second hand shelves before they go on sale and only stock second hand industrial shelving that is of excellent quality. We offer a range of single and multi-bay second hand shelving options. Our 5 bay and 10 bay continuous shelving units provide the perfect storage solution for your warehouse, distribution depot, workshop, stockroom, garage or shed. They are ideal for use with parts bins, Euro containers and tilt bins all of which are also stocked by Rackzone.